I go out to lunch pretty regularly with a friend. We were looking for a new place to eat, and found this little gem on the internet. It’s very close, but tucked away in a little strip mall at 583 North Rand Road, in Lake Zurich. Primarily a fresh seafood store, Diamond Fresh Seafood serves meals in their cafe Tuesdays thru Saturdays. Lunch is available Tuesday, Wednesday and Saturday from 11:00 to 2:00. Cafe hours are 11:00 to 7:30 on Thursday and Friday. The friendly proprietor advised that all their items are either gluten free, or can be made gluten free, with the exception of their fresh crab cakes. Even the crab cakes can be purchased gluten free if you buy them frozen or order ahead. 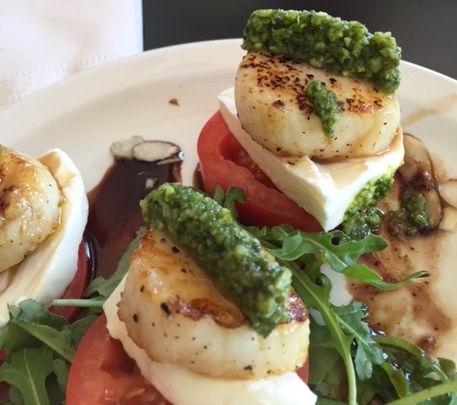 Although I had the delicious Scallops Caprese on this visit, you can be sure I’ll be eager to return to try their gluten free fish and chips. What a thoughtful idea to prepare these popular items so that GF folks can enjoy them! Their menu is fairly informal, with soup, salads, sandwiches and wraps. Tacos, lobster rolls, and fresh fish dishes round out the offering. This Diamond was truly a gem of a find, and I expect to be back often. This entry was posted in Restaurant Review and tagged Diamond Fresh Seafood, fish and chips, gluten free, Lake Zurich, lobster roll, Seafood on March 13, 2015 by goforsix.